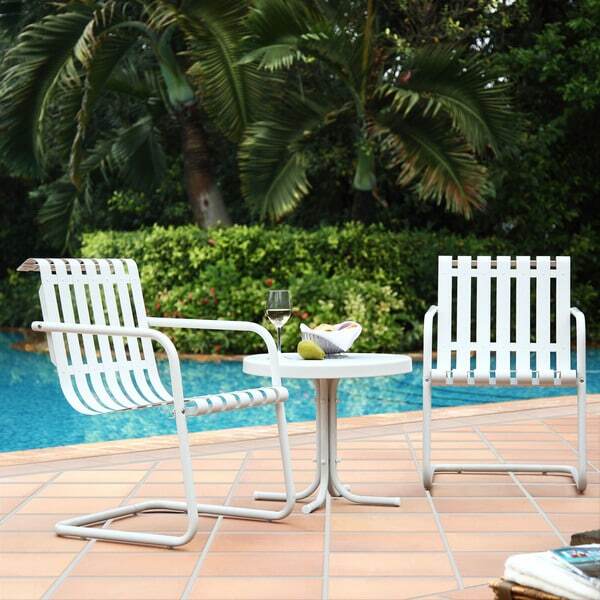 Make the most of your patio with this three-piece outdoor seating set. Featuring a white side table and two matching chairs, this set is crafted from powder-coated steel to withstand wear and tear. Beautiful set. Exactly as expected. These are not white! A true alabaster offering a slightly off white appearance that blends with everything. I expected them to sort of "bounce" with the curved frame but they don't. The seat gives just enough when you sit to offer a very comfortable fit. The end table is a nice addition. Slightly larger than expected which is perfect for flowers and candles with plenty of room left over for drinks and snacks. Well constructed and worth every penny. These are just terrific. Blend perfectly with my vintage chairs. Sturdy and easy to assemble. This little bistro set is perfect for morning coffee on my front porch! I was a little worried about the chairs being to small or uncomfortable, but they are comfy and plenty big enough for my husband. Just received this today. It was well packed but they used dirty bubble wrap, not a big deal but just wonder why. They have to be assembled but hopefully it wont be too difficult. They appear to be well made and we’re looking forward to sitting on this bistro set for our morning coffee on the deck for a long time to come. Assembly wasn't too bad. Very pretty for poolside! "What are the dimensions for the chairs and table?"